Since the Jeep is marked up as the 100th Photo Lab vehicle, I thought it would be nice to have a little display along the same theme. 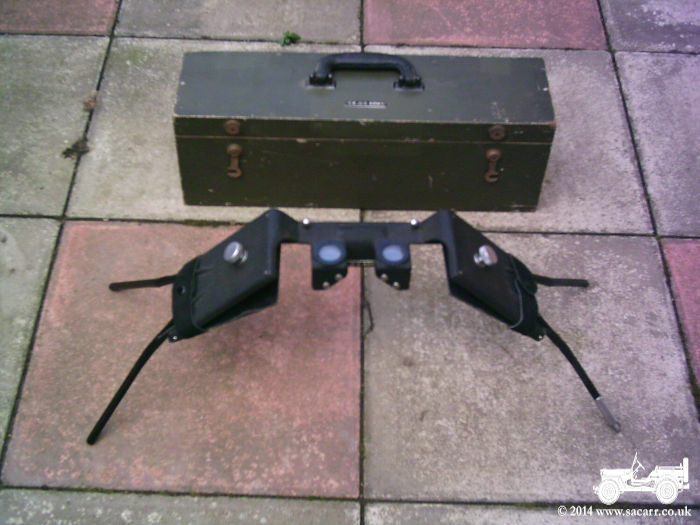 Fortunately, I already had some equipment that would work, and I've been getting some other odds and ends together. 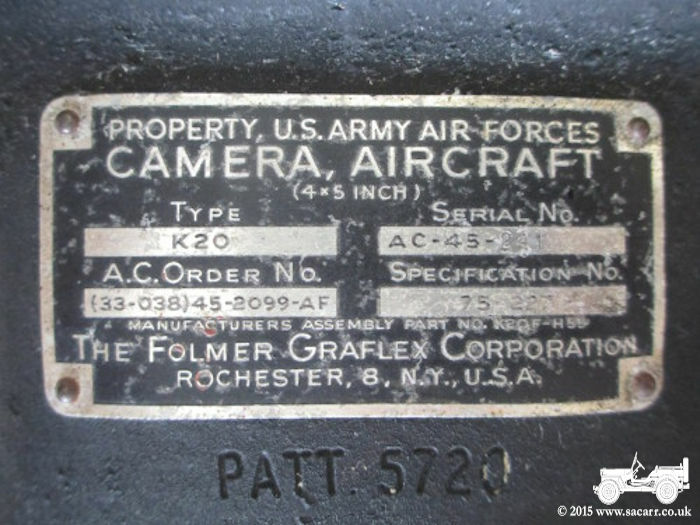 In early April 2015, I spotted this Folmer Graflex Corp K-20 aerial camera on Ebay. It was missing its case, but as a result, didn't reach the price that boxed versions have done. 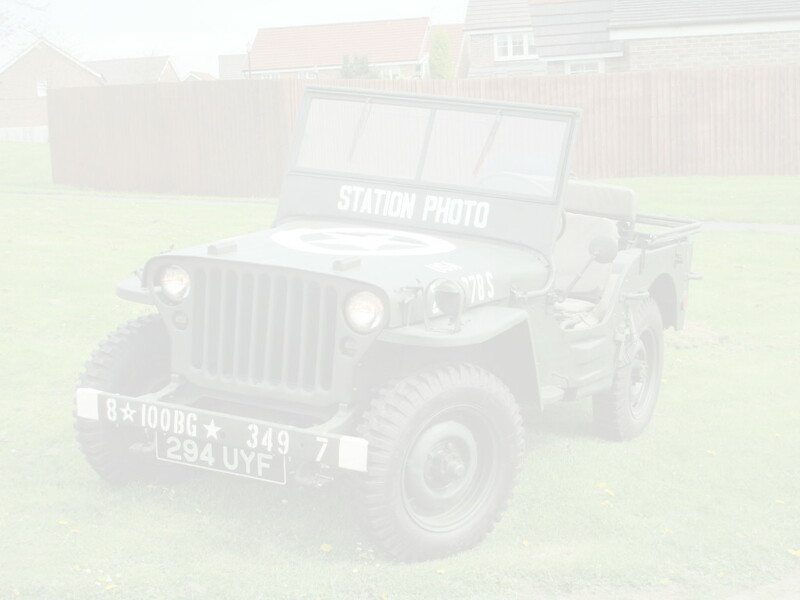 Based on the serial number, it appears to have been manufactured in 1945. 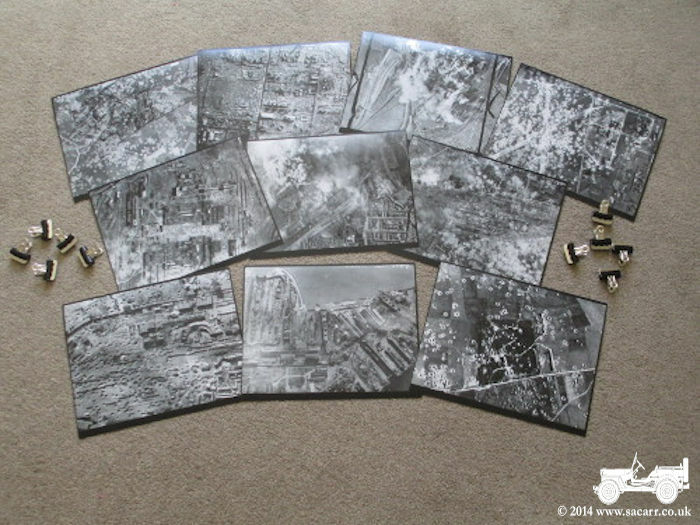 It will make a great display item to join the rest of my photographic items. 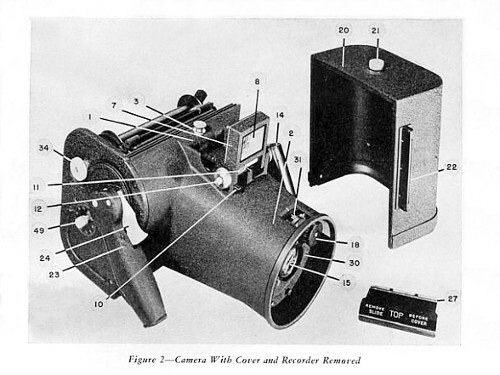 The K20 was designed by Fairchild, and approximately 15,000 were manufactured under licence by Folmer Graflex Corp in Rochester, NY between 1941 and 1945. 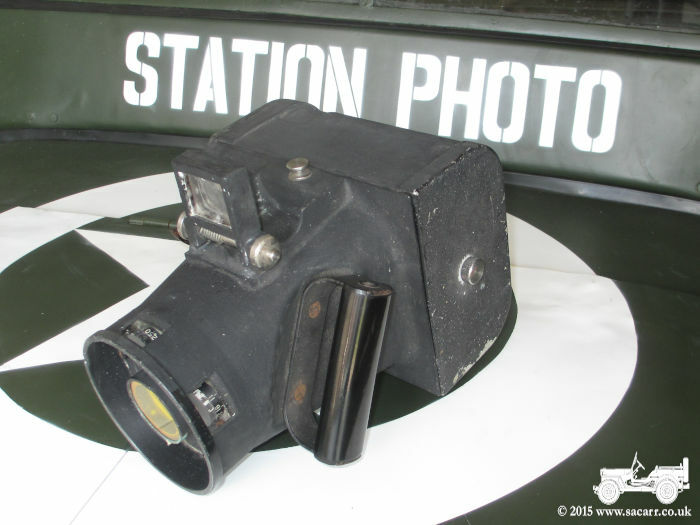 It used a 5 1/4" wide film on reels from 20 to 200 feet in length, producing a 5 x 4 inch image. 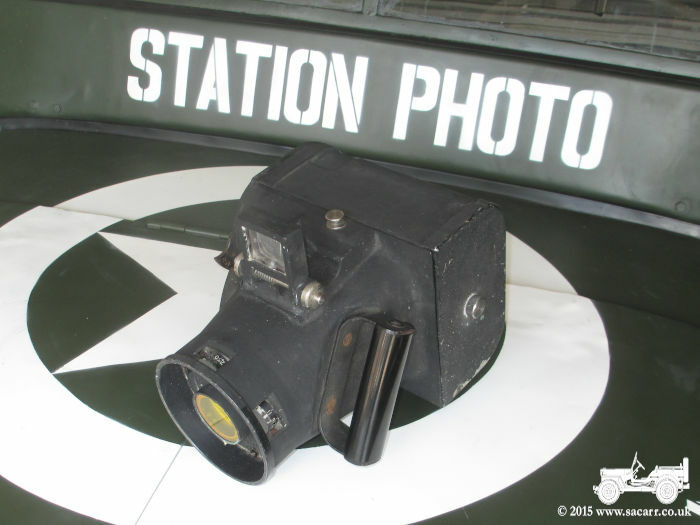 The lens is a 6 3/8" f4.5 with an adjustable diaphragm, and made by Kodak, Ilex and Bausch & Lomb. It weighs 11 3/4 pounds loaded, and measures 9 1/2 x 7 1/2 x 11 inches. 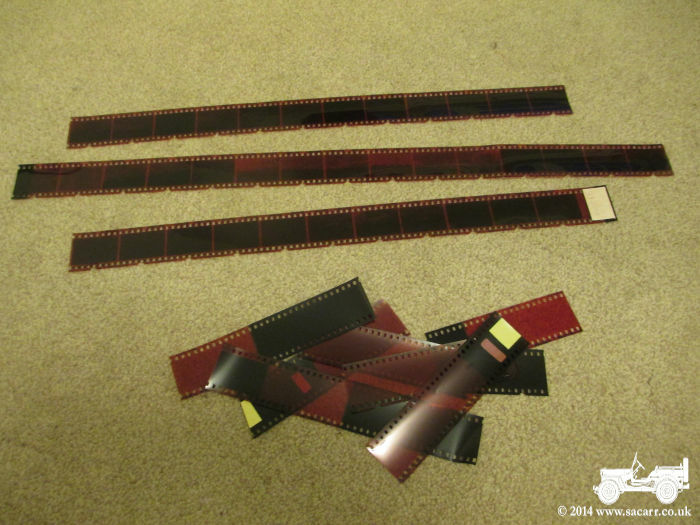 It will give 50 images with a 1/2 inch space between negatives from a 20 feet long reel of film. 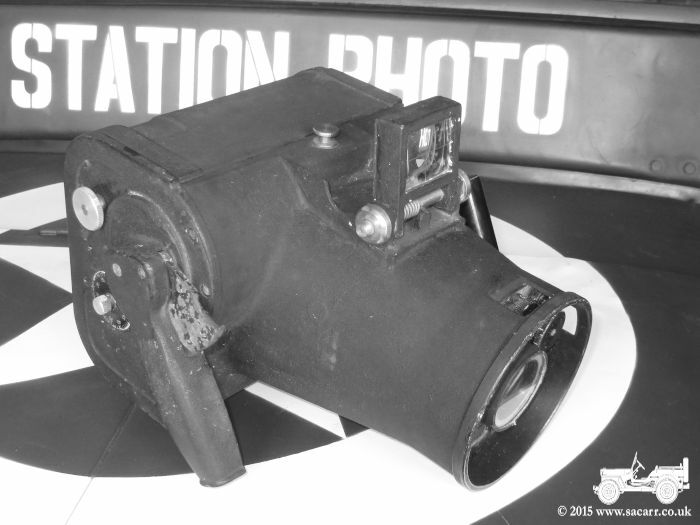 Understanding photographs was a key factor, both before and after a raid. 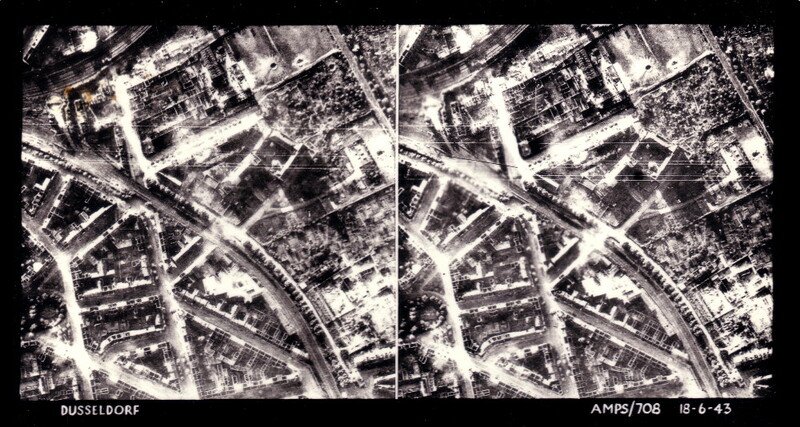 Before a target could be bombed, the type of structure had to be fully understood as this would dictate the correct fusing of the bombs to ensure the targets destruction. 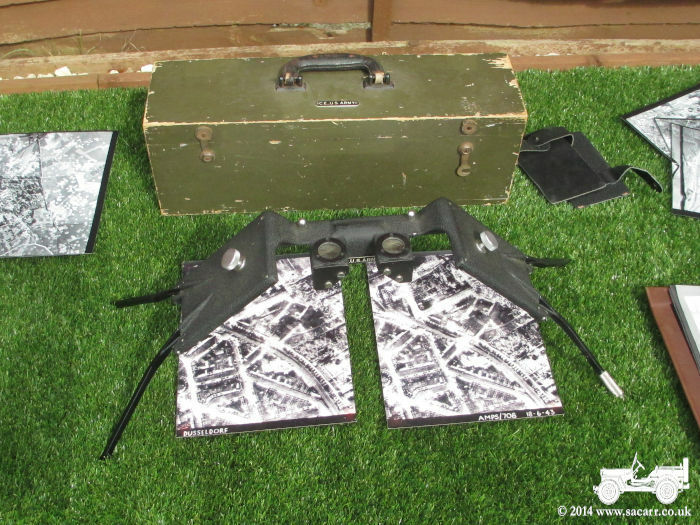 By taking two photographs of the same area, from slightly different angles, and then viewing them through a stereoscope, a three dimensional image can be seen. This helped to understand the construction of the target far better than a 2D photograph. In the same way, damage to a target could be better analysed using a 3D image. 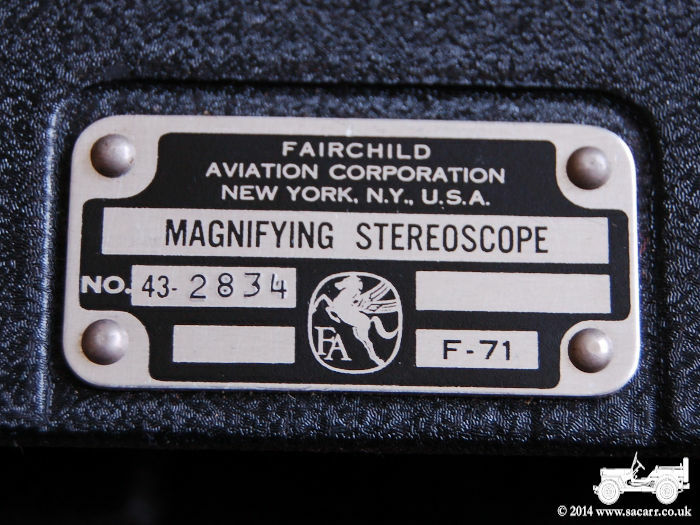 The Fairchild F-71 Stereoscope was purchased a few years ago, but is a very suitable display item to go along with the new Jeep. 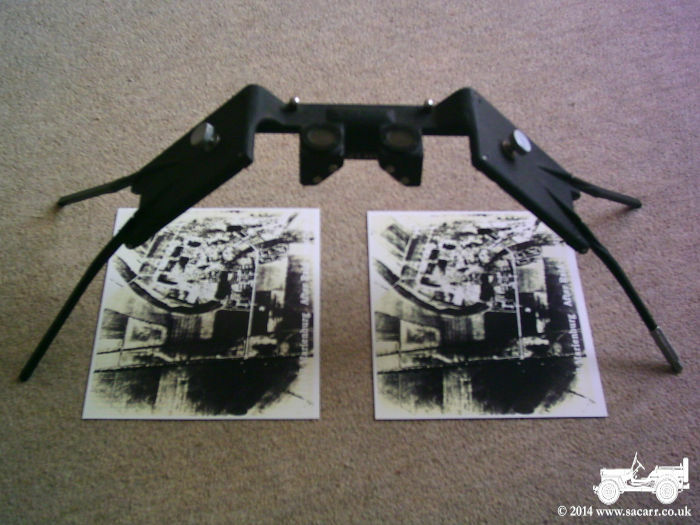 After much searching on the internet, I finally found a stereoscopic target photograph on Ebay. There are plenty of target photos on line, but stereoscopic pictures seem hard to come by. The original picture I bought was only printed at about 2.5 inches square, but after scanning and cleaning up, it was enlarged to give a decent size image to use under the stereoscope. 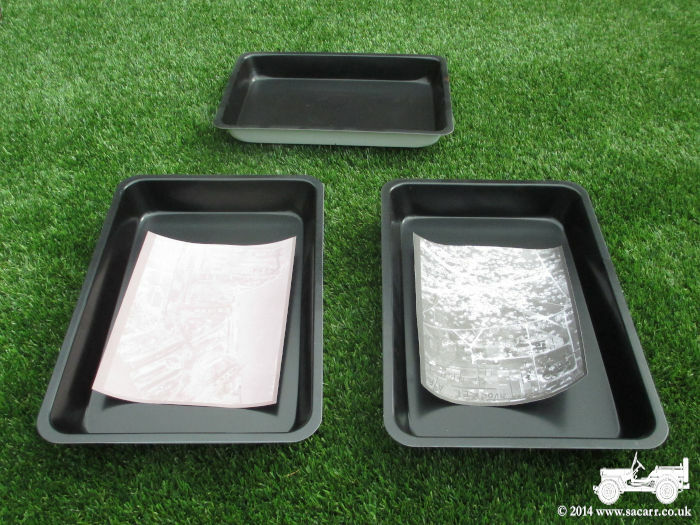 I found some very cheap baking trays on Ebay recently, which will make ideal developing trays for the photos. The bottoms were resprayed white from the original red, which makes them look much better. So with a nice sunny day, I got all the bits and pieces out for a picture. I printed out some additional target photos which will be laminated in clear plastic. They will then be able to be left in the trays full of water to look like they are still developing. One has been printed quite faded, showing the picture as it would part way through the developing process. 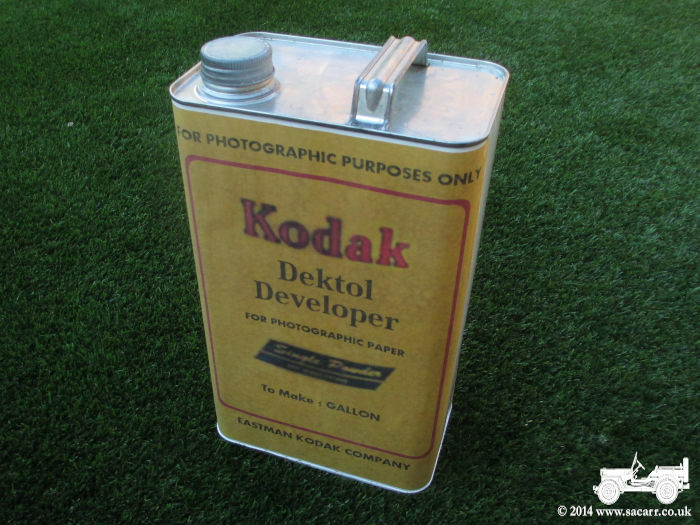 I will need to carry some water, to fill the trays, and rather than a plastic bottle, I made a "Developing Fluid" tin from an old engine oil container. The tin was cleaned and sprayed, and then some vintage looking Kodak labels made on the computer, based on some photos I found on the net. It can now be another display item as well as being the water carrier. 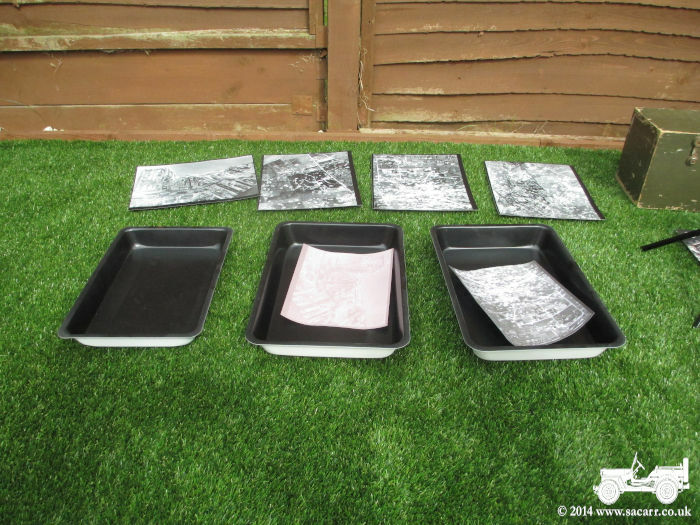 Something else that the younger generation probably have no knowledge of is photographic film/negatives. While I don't have any strike camera negatives, I do have some old 35mm aviation negatives, and these will make a nice addition and talking point. 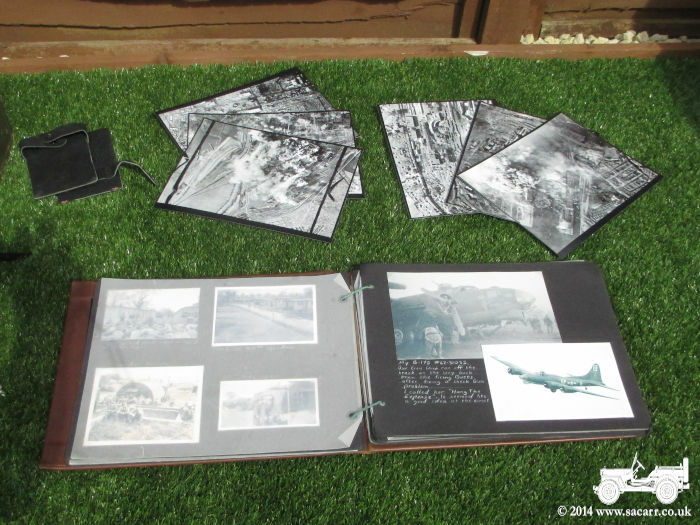 Together with my photo album of 100th Bomb Group pictures, they will make a nice display. I also bought two six feet long wood strips and with some string between them, will make a drying line to hang some of the pictures on.